SEATTLE, WA (CelebrityAccess Mediawire) — Sleater-Kinney are releasing No Cities to Love, their first album in ten years and most explosive collection of songs to date, on January 19/20 worldwide via this very record label, Sub Pop Records, with North American and European tours to follow. , Sub Pop Records, Kept this secret for quite long. 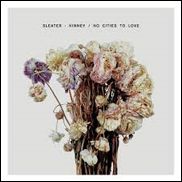 After ten, Sleater-Kinney-less years, that No Cities to Love came to be. Well, the trio – Corin Tucker (vocals/guitar), Carrie Brownstein (guitar/vocals) and Janet Weiss (drums) – recorded the new record in top secret, highly disguised sessions at Tiny Telephone Recordings in San Francisco in early 2014, with additional sessions at Kung Fu Bakery Recording Studios in Portland, and Electrokitty Recording in Seattle. John Goodmanson, who helmed four previous Sleater-Kinney albums, produced No Cities. That’s a lot of sneaking around. The trio surprised fans and music publications alike by including the new song “Bury Our Friends” as a one-sided 7” with the October 21 release of ‘Start Together’ (hey, we put that out, too), a limited-edition vinyl boxed set comprising remastered versions of their seven previous albums. The colored vinyl edition of ‘Start Together’ sold out weeks before release and a second, black vinyl edition is available for pre-order now (get yets quick, they’re moving quickly). No Cities to Love is now available for pre-order on CD / LP / DL through the Sub Pop Mega Mart, iTunes, Amazon, and Sleater-Kinney’s website. A limited, deluxe edition on white, 180-gram vinyl will also be available. The deluxe LP version features a tri-fold jacket encased in an outer slipcover, and includes two bonus tracks on a single-sided 12” with an etching on the b-side, you know, for fanciness. A little S-K background: Sleater-Kinney formed in Olympia, WA in 1994, and set a new bar for punk’s political insight and emotional impact, earning the mantle of “America’s best rock band” (Greil Marcus/Time Magazine) along the way. Since the 2005 release of The Woods, which Entertainment Weekly called “a masterpiece” (uh-duh), Tucker has released two albums with the Corin Tucker Band, while Brownstein and Weiss released one album with Wild Flag. Brownstein also co-created and co-stars in the IFC series ‘Portlandia,’ and Weiss has recorded and toured with Quasi and Stephen Malkmus and the Jicks, among others.